The world is filled with ways to measure: length, height, weight, capacity, money, temperature and time…to name just a few. At age five, children are often ready to move beyond basic ideas of measurement ("this block tower is taller than this one") and begin making measurements using numbers ("the table is as tall as eight pencils"). Measurement and data collection are important in science, art, cooking, sports and engineering — so there are plenty of ways to help your child learn at home! At this age, your child will be ready to start exploring the value of money. At this age, your child will be ready to start exploring the value of money. Start with pennies and nickels. Explain that you could exchange five pennies for one nickel. Then set up a pretend store in your kitchen and start labeling things with how much they cost, like three cents for spaghetti or six cents for a can of soup. Let him go "shopping" with a lot of nickels and pennies and try to pay you correctly for each item. Talk about hot and cold weather with your child. Discuss what kinds of clothing you wear and what kinds of activities you do in each weather condition. If you have an outdoor thermometer, explain how to read it. Have your child check the temperature at different times of day and different times of the year. Compare the temperature inside (using your thermostat) versus the temperature outside. Add some geography to the mix: use weather apps to compare temperatures in different parts of the world. Harry calls his meteorologist friend Janice for advice on handling his fear of a thunderstorm. Your child can learn about GPS coordinates and weather patterns from this clip. 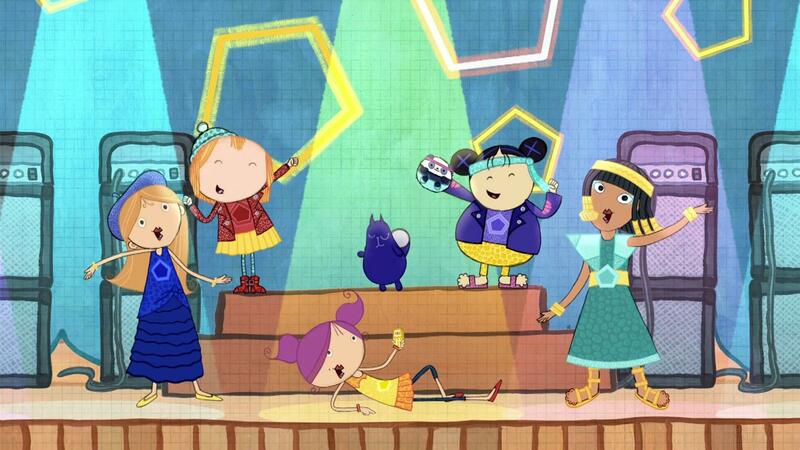 The Pentagirls concert can teach your child about shape properties and geometric transformations in this concert clip.